The 1960’s were an exciting time, living in Covent Garden, painting and creating kinetic sculpture in Perspex. Set Decorator on films & TV. Based in the heart of London gave Carlotta an interest in cities and architecture; she still travels widely taking sketchbook and paints, fascinated by other cultures. Then the magic of Purbeck drew her back to the place she loves, where the marble ledges snake into the sea and where she grew up in the last house on Peveril Point. Here she says there is inspiration in every aspect of the land and seascape, above and below, from the million year old rocks and fossils to the seabirds and ever evolving life of nature and humanity. Being surrounded by quarries a new interest in stone has developed, after studying with stonemasons she has developed a passion for carving. 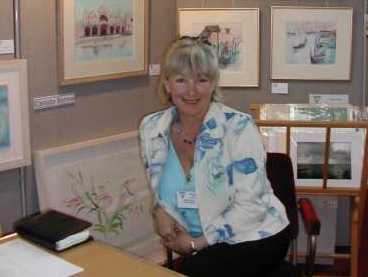 Now regularly exhibits her paintings and stone carvings at the Waterside Studios and garden at Peveril Point, Swanage. Also exhibits in galleries in London, the West Country and Dorset Art Weeks. Her work is in many private collections in England and abroad.